This story was written with young folks in mind. Can you imagine a mouse family living in the same den as a fox family, and even sleeping together? Foxes hunt mice, you know. Most foxes, that is. But not this fox family. In this fox den, the baby mice and the baby foxes grow up together. The little mice babies snuggle into the fox baby's fur. These foxes and mice are friends. And always will be friends. Forever. You see, a long time ago they saved each other's lives. 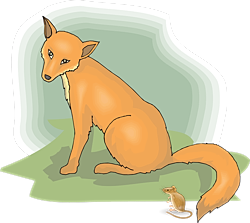 A mouse family saw hunters enter the field with their fox hounds. "Oh, no!" said Father Mouse. "They're going to hunt the foxes." "But that's good," smiled Boy Mouse. "Then the foxes can no longer hunt us!" "Oh, but Boy Mouse, we mustn't wish harm to any creature," said Mother Mouse. Then Girl Mouse chimed in. "I can run faster than the hunters! I can warn the foxes!" "Go!" said Father Mouse and Boy Mouse and Mother Mouse all at the same time. Girl Mouse ran as fast as she could. Her little legs were a blur. Her tail pointed straight back from the wind, so fast was she running through the grass. Straight into the fox den she ran and jumped right on Father Foxes head and yelled into his ear, "The hunters are coming!" "Run!" all the foxes yelled to each other. In a flash, they were out of their den and headed into the creek. They waded in the water so the hunting dogs couldn't smell their tracks. Soon, they came to their emergency den. After she got her breath back, Girl Mouse returned to her family. The hunters looked in the fox den, but no foxes were there. The hunters knew the foxes were somewhere, but they couldn't find them. And their dogs couldn't track them. The hunters thought they could flush the foxes out of wherever they were hiding by burning the grassy field. The fire slowly burned along the edge of the field. Then it got bigger and started burning the whole field. When the foxes smelled the smoke, they knew they were safe in their emergency den. The fire couldn't reach them. But Boy Fox thought about the mouse that saved them. "Dad," he said. "We can't let the mouse family burn. They saved all of us!" "You're right," said Father Fox. "Son, you know where the other emergency den is. Right? The one over the next hill, in the woods among all those rocks?" "Then save the mice! Take them there." And Boy Fox did. He ran to the mouse home and told the mice to jump on his fur and hang on! The hunters saw Boy Fox run but they couldn't catch him. Both the foxes and the mice were saved that day. The fox family and the mouse family have been friends ever since. Every generation, they raise their families together, sharing a den. Use this form to send a private note to Will Bontrager, the author of The Foxes and the Mice.